Here is a picture of the new damage model. It is pretty straight-forward, that’s how I want it to be. I have already coded it and it plays really well with bots. One shot kills bring a completely new dimension to this game. It should have been like this from the start. Previously damage was weapon specific and calculated based on bullet speed. I think, even though it is realistic, this is confusing and hard to balance. This damage model is unified across all current weapons. This means be it pistol or sniper all have nearly the same damage. They vary slightly when hit in other areas except head. 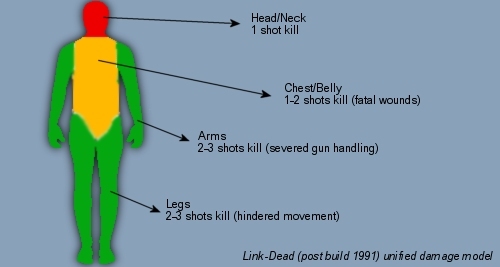 So every gun kills when shot in the neck or head (with the exception of multiple shot weapons like nailer or shotgun – damage is spread evenly across bullets then). So guns will vary now only in bullet speed (but does not affect damage), fire rate, maneuverability, weight, recoil, steadiness and so on. I also fixed a bug which is really caused by the game being played on a 2D plane. If your arms are in front of you, the bullet will hit the arms instead of the chest. I made it to check the chest now first for bullet collision, so there are more critical hits in the chest and head instead of arms. I fail to see the point in this when the existing damage model fails to register half the shots. Maybe that’s just the joy that is Master Server, but still. Shotguns and the likes should definetly lose power at range. Oh, and what about railguns, grenade launchers and other, actually interesting non-peashooters? Oh, and what about armor? I am inclined to believe that the sniper rifle would outperform a pistol against that. Has long has armor provide a reason to use a stronger weapon like the railgun, I’m all for it ! Hm…interesting approach. Will make it definitely more realistic. But talking about realism: Why should I choose a slow shooting pistole if I can some automatic weapon which shoots much faster and therefore also kills faster? Yes, it would weight a bit more. But imo that’s the only real disadvantage. With this damage model I would suggest to let us change the fire rate of the automatic weapons. So either 1-shot, 3-shot or automatic. MM recently said he was considering making movement speed dependent of the weapon you have in hand. IMO gun wobbling is pretty high on all gun right now, making the pistol almost totaly accurate AND having Headshots would make it a weapon of choice. I really like your fire rate suggestion. This kind of options usually add to the tactical feeling of a shooter! DAMAGE VS. ARMOR should be a gun stat. illu: smaller weapons are easier to handle, meaning: their aim is as accurate as your mouse cursor movement. Also you can shoot pretty good while running with a pistol or smg. Grenades and nade launchers can knock-off the entire armor in 1 shot. Sniper is 100% accurate, so is good for long shots. Other guns are not that accurate (accuracy is a random deviation from were the gun is actually aiming at). But still though, I think that at least HEAVY armor should stop bullet enough when hit to head, no kill. Maybe loose 80%. Sorry I didn’t write about armor. Armor stops bullets, even at head. How much do they refuse damage? I sadly have to say that I really dont like the new changes. The new damage model has reduced the gameplay to “whoever shoots first wins”. Escaping from a fight is highly unprobable, so usually you just run around until you find an enemy, and then they both shoot until one of them is dead. Then you move on. This is opposed to the way it was before, where you could actually escape, recover and return if the situation permitted. Also, the one-shot-kill makes head and body armor a must, so there’s not much flexibility left in the things you choose. Bots are also incredibly boring because of the one/two-shot kills. They oppose no threat whatsoever. The weight also feels strange now… have you dropped the easy-medium-heavy levels for percentages? It feels much less mobile than before. Will you post a more elaborate post about the direction you are taking this? I do not think this is a good idea. Guns shoot different sized bullets, a pistol shoots a very small(usually) bullet that does little damage unless it hits in a critical spot. Some sniper rifles can shoot a very large bullet that can sever a man in two, or at least blast a gaping hole. I think hit location should just apply a damage multiplier to how much damage is done. Like a head shot would be 7x, upper torso 3.5x, arms 0.8x, upper legs 1.2x, lower legs 0.8x, ect. Yeah, that sounds more reasonable. 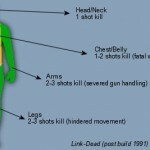 So both a gun and a sniper can one-shot-kill you with a headshot, but hitting the upper body, a gun would need multiple shots to kill you, while a sniper would still have a 1-shot-kill.